^ 1.0 1.1 ORD的美国联邦航空局机场记录 (表格5010 PDF), retrieved March 15, 2007. ^ City of Chicago, Airport Activity Statistics, December 2006 互联网档案馆的存檔，存档日期2007-03-28., published February 27, 2007. ^ Table 6: Ranking of Major Airport On-Time Departure Performance Year-to-date through July 2006. Bureau of Transportation Statistics. （原始内容存档于2007-09-29）. 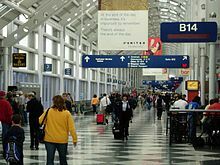 ^ Subcommittee on Aviation: Hearing on Delay Reduction Efforts at Chicago’s O’Hare Airport. United States House of Representatives. （原始内容存档于2007-01-05）. ^ In the sky! A bird? A plane? A ... UFO?. Chicago Tribune. [January 1, 2007]. ^ Karp, Gregory. United Continental Planning Upgrades to O'Hare's Terminal 2. Chicago Tribune. February 3, 2012 [February 3, 2012]. ^ Karp, Gregory. O'Hare Shows Off Updated International Terminal. Chicago Tribune. April 4, 2014 [April 5, 2014]. ^ AirBridgeCargo Service begins at O'Hare International Airport (新闻稿). Chicago Department of Aviation. May 5, 2011 [July 15, 2012]. ^ China Southern Cargo Schedule. [March 28, 2013]. （原始内容存档于2014年1月19日）. ^ EK Cargo Global Network. [May 9, 2013]. ^ Etihad Cargo expansion. May 30, 2013 [May 31, 2013]. ^ Jet Cargo and LOT Polish Airlines Cargo Has Launched a Route from Katowice to Chicago (新闻稿). Airport Pyrzowice. February 14, 2012 [July 15, 2012]. ^ 2013 summer schedule. Aero Logic. [August 13, 2013]. ^ 20.0 20.1 Qantas Freight Launches Chongqing Route. Air Cargo World. April 20, 2012 [July 15, 2012]. （原始内容存档于2012年7月30日）. ^ Qantas Freighter Network Northern Summer Schedule 2010 (PDF). Qantas. June 2010 [July 15, 2012]. （原始内容 (PDF)存档于2010年12月30日）. ^ Qatar Airways to Begin Chicago Freighter Service. AMEinfo. August 2, 2010 [November 3, 2010]. （原始内容存档于2010年8月3日）. ^ Qatar Airways to Start Milan-Chicago Freighter Service. June 6, 2013 [June 29, 2013]. ^ Singapore Airlines Cargo. Singapore Airlines Cargo. [June 10, 2013]. （原始内容存档于2013年5月17日）.